My paternal grandmother had a dressing table something like this. She used to sit before it and brush her long, thick gray hair (which was once auburn) and then coil it up on top of her head in two fat braids, secured with tortoise shell combs. But the picture I have in my mind is a bit fuzzy around the edges. I wish I had a photograph of this part of her daily routine. I would love to see the details again — the colours and the shapes that made up my grandmother’s world. In the last little while I’ve been looking at old family photos in albums. My father was an excellent amateur photographer. He took black and white photos on a Rolleiflex twin lens reflex camera that my mother gave him before I was born. His images captured the details of people living life with love and artistry. 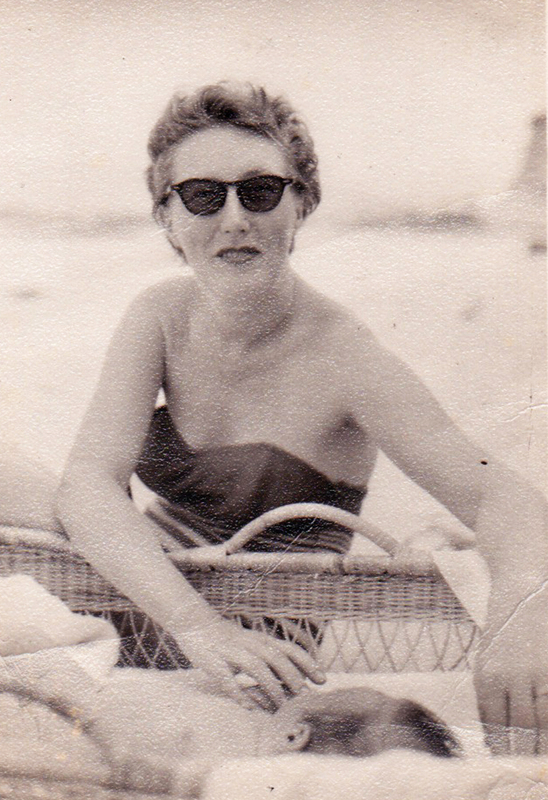 My mother, circa 1958, in Singapore. That’s me in the basket. Later on, he progressed to even fancier cameras and colour film, but I think that his early black and white work was some of his very best. Through these photos, the past is not lost to me and my family. Like many others, I take photos of special occasions and also everyday moments — the grandchildren picking carrots from our garden and wrestling with Grandpa, our travels on the sailboat in the winter, our family outings — as a way to help us all remember down the road…the details of our days, the richness of our lives. So how do you remember? What a beautiful image of you and your mother. She looks so glamorous! That is why I love photos so much, they help me remember. But if all else fails… words. What a lovely post…and what a beautiful photo of your Mom (and you! )…old photos are my favorites. There are so many memories inside each one…it’s both a wonderful and a bittersweet feeling to look at them. Thank you for sharing! What a wonderful photo! I just love old photography. I love this post (found your blog through SS). I remember similar things and also wish I had photographs of some of those memories, especially of my mother and grandparents. When my mom died I wasn’t able to keep much of her things and now I wish I would at least have had the mind to simply take photographs of those things. There have been many things I think of and how she used them or simply that they were a prominent part of her everyday life … had I taken a photograph I’d at least have the details again. This was such a lovely post. Lovely words… your Mother looks very glamorous and proud of her tiny bundle. 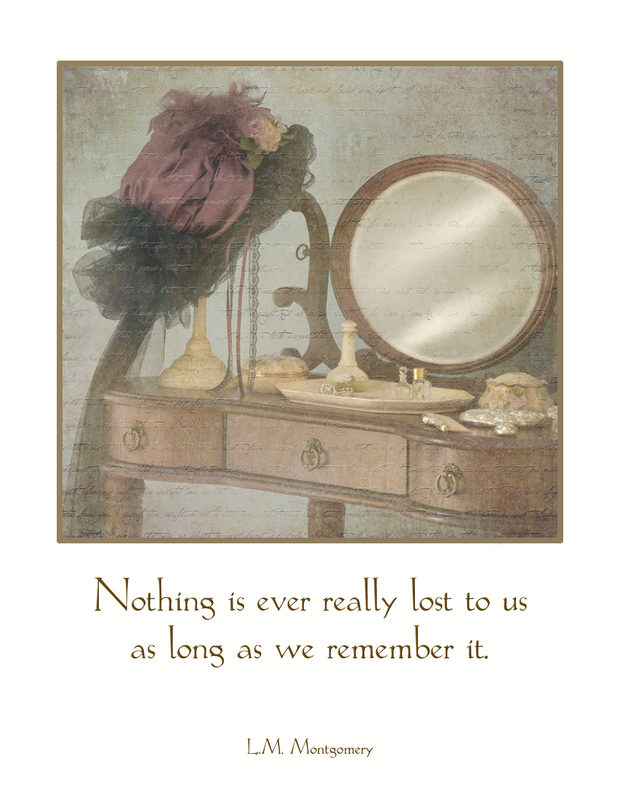 I love the picture of the vanity table and the processing you have done. Such lovely thoughts and photos Sherry I love family photographs . Thanks so much for visiting my blog today i had a lovely meal at Jamie’s such wonderful food and service…..
wonderful….. I hope you show more of your old photos. I could sit and look at them all day. I hope to do some still lifes of my grandmother’s things soon. Thanks for your lovely comments, Sandra. The “unknown” was not intentional, I assure you. I tried to link to my wordpress site in the comments box but it did not seem to work! Thanks to your visit to Reflections and Nature I can come and visit you here! I love your peaceful header and the picture of the dresser with the old-fashioned and very feminine hat. What a lovely picture of your mother and you in that baby basket and how lovely that you remember your grandmother brushing her long hair in front of a dressing table rather like the one pictured. How unusual to call yourself “unknown” on my blog. I hope that you will put your real name if you visit me again! This piece is too perfect for words. Thanks, Sherry.